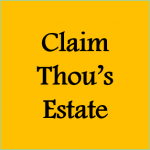 Thou’s estate held in trust. Claim it. Some of the best knowledge is in comments, on YouTube videos, Facebook, blog posts. The comment below explains that our original trust, the one we are given when we are born, is held in trust by the sovereign state. We are using a second trust created by other entity. The second trust seems to be our trust because it uses our given name (aka first name) and family name (aka last name). Here’s the comment, originally from the video Karl Lentz Method Explained. A similar method of taking the original trust is embedded in the language of the current Christian religion (re-legion). The church promises life after death because they take thou’s first life (trust) and give thou a new one to use.